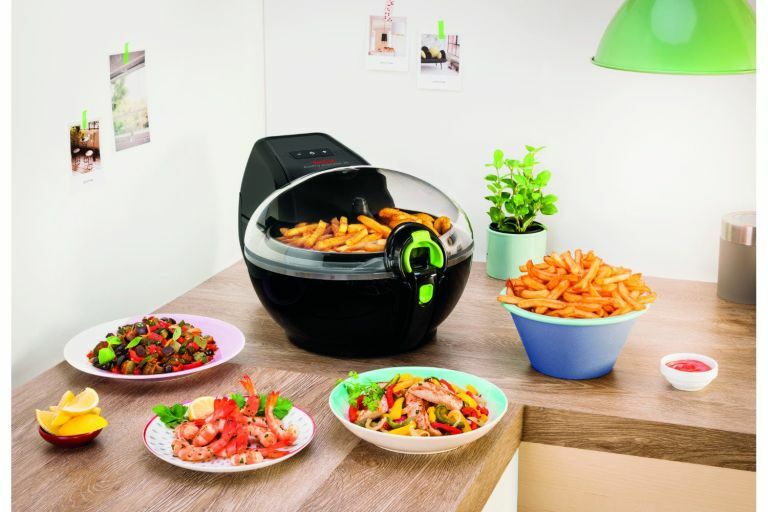 As the latest in a long line of kitchen gadgets designed to fit in with our more health-conscious lifestyles, the air fryer makes some big promises: deliciously crispy fried food, in the comfort of your own home, but better for you. In short: it lets you have your chips and eat them too. But is it too good to be true? Surprisingly, no. These little beauties have come on leaps and bounds since the first prototypes, and a good air fryer can be a really valuable addition to your home-cooking repertoire. On the other hand, there are some models that are hard to clean, hard to use, or will just leave you with soggy breadcrumbs and a feeling of bitter disappointment. We’re here to help you avoid pale imitations, and instead find the gold standard of home fryer for spot-on suppers every time. Check out our appliance buying guides for more kitchen appliance recommendations. To start with, how many mouths do you have to feed? How much worktop space do you have to spare? Larger capacity fryers are good for big family meals, but will take up more room in the cupboard or on the counter. What else can your air fryer do? Some models are great little multi-taskers and have the ability to reheat, roast, or grill as well as fry, so if you’re in the market for a versatile small appliance, these are a good bet. Finally, if you’re short on time, but your ingredients' list is long, look for an air fryer with cooking rack included, which offers an extra compartment for cooking two different foods at the same time, or one with a mixing paddle, so you don’t have to hover over it. Oddly, the Tower T14001 doesn’t take our top spot as the best fryer, but as the best all-round appliance, especially when you take into account the phenomenally good value it offers. It fries, bakes, roasts, grills, and steams, and while it can be tricky to master, once you do, it’ll be your go-to every dinner-time. This glass shell means you can see the food as it cooks, so you can cook precisely to your preference. And all this for under £100. If you just want an easy-to-use fryer, consider the Duronic AF1/B, but for all kinds of cooking in one appliance, this is the perfect buy. This Andrew James air fryer performs beautifully, especially for its bargain price. The easy-to-operate digital display allows you to cycle through automatic settings for commonly-cooked foods, or set your own temperature and time for more unusual creations. It also comes with a divider for cooking two kinds of food at once, cutting down on post-meal washing up (always a bonus), and reviewers have noted that it’s impressively quick. A fantastically good fryer on most fronts, the only downside being the lack of viewing window and the need for manual turning, but we can overlook it for the sheer value. The Tefal ActiFry might not be as versatile as the Tower T14001, but what it does, it does very well indeed. As a large-capacity, easy to clean low-fat frying machine, it’s ideal for families. You can cook a lot in one go, whether that’s casseroles, curries, or – if reviewers are to be believed – the perfect crispy chips. Frying requires just one spoonful of oil, making it healthier than your average; the stirring paddle means you don’t have to stand over it; and it has removable, dishwasher-safe parts, so you don’t have to spend hours scrubbing. The Breville VDF105 Halo looks a bit like an astronaut’s helmet, but cooks like a dream. It has a durable non-stick ceramic coating, tilt function, and rotating bowl for even cooking and easy release, and comes with a roasting rack included. It also handles different types of cooking with ease, so you can fry, grill, roast, and even bake with confidence. The auto shut-off with alarm is also a nice touch for the forgetful cooks among us. If you have your eye on the ActiFry, but want to save a few pennies, this is a great alternative. This healthy-fryer-meets-mini-oven boasts an adjustable temperature dial, putting you in complete control; but if you’re not the most confident cook, there’s a handy guide listing cooking times and temperatures of popular foods on the front of the machine, a really nice feature. Its small size makes it easy to store, but slightly trickier to clean, and it’s not as automated as some other models (you need to shake the tray part-way through cooking). But as long as a little intervention doesn’t put you off, it’s a great option for small kitchens. If you tend to return to a few favourite dishes time and time again, the Philips Viva Airfryer is the one for you. As well as a range of handy presets, it offers the option to store favourite settings for next time. Like Tefal, Philips have been in the air fryer game for a while, and this is a vast improvement on earlier models, with faster cooking times and a larger capacity. If you’re looking to upgrade an older fryer, make this your next purchase. While we’re talking specifically about the 4.5 litre model here, it’s well worth noting that the Salter Healthy Digital Hot Air Fryer comes in two smaller options, so you can pick the best one for the size of your brood, and the size of your kitchen. It’s brilliantly simple to use, with a sleek, clean, touch-sensitive interface that makes it look much more high-end than its small price tag. It doesn’t make the crispiest chips, but it cooks well, runs quietly, and is easy to clean. Thumbs up all round.